About American novels Mencken could talk endlessly – he thought Tom Sawyer and Babbitt were the best – but Ross was soon lost and floundering. He had said to me, after reading Peter De Vries’ accurate parody of Faulkner, ‘Does Faulkner still write this way?’ The sentence structure and punctuation dismayed him, and he could have got little further in any Faulkner than in Joyce’s Ulysses. He was always wary of his own book department, approaching it with curiosity, respect, and trepidation, the way I once saw a Scottie approach a turtle. Through it all went the unending fuss and fret about commas. The New Yorker’s overuse of commas, originating in Ross’s clarification complex, has become notorious the world over among literary people. In Paris, in 1955, an English journalist said to me one night, ‘The biography of Ross should be called The Century of the Comma Man.’ A professor of English somewhere in England wrote me ten years ago a long, itemized complaint about the New Yorker comma, objecting to, among other things, its use after ‘moreover’ and ‘furthermore’, in which, he said, the comma is implicit. He picked out this sentence in a New Yorker casual of mine: ‘After dinner, the men went into the living-room,’ and he wanted to know why I, or the editors, had put in the comma. I could explain that one all right. I wrote back that this particular comma was Ross’s way of giving the men time to push back their chairs and stand up. Previously: James Thurber on writing and rewriting. This entry was posted on Tuesday, May 17th, 2016 at 9:06 pm and is filed under books, editing, humour, punctuation, stories, writing. You can follow any responses to this entry through the RSS 2.0 feed. You can leave a response, or trackback from your own site. Thank you, Stan, for reminding me of how much I loved Thurber. 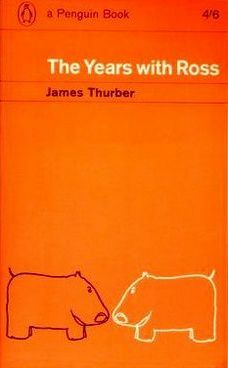 I’m going to reread “The Years With Ross” on the next rainy afternoon. My pleasure, Virginia. It makes an excellent rainy-afternoon diversion. I prefer too many commas (as in the New Yorker style, I still think, today), rather than too few! I tend towards the minimum necessary without loss of clarity, though it does depend on the context and my mood on the day. The ‘close’ style of punctuation has fallen from favour somewhat; this is something I looked at in more detail at Macmillan Dictionary a few years ago. How wonderful, though, that this tiny, twisted teardrop should have such expressive power. Samuel Beckett was marvellously disconcerting in their deployment, when he chose to use them. Steve Connor, discussing Beckett’s commas [Edinburgh Companion to Samuel Beckett and the Arts] says that they seem to be ‘allied to a principle of decomposition’ and quotes Richard Coe, who says that Beckett’s commas are used to break the continuity of thought, so that ‘each section of the sentence comes as a surprise, seemingly arbitrary and unexpected, assimilable or discardable upon the whim of the moment’. A nice analysis, thank you; one could argue that almost any aspect of Beckett’s writing is allied to the same principle of decomposition. The expressive power of commas is marvellous indeed, though elusive to some: Yeats wrote ‘so completely for the ear’ that he was baffled by the mark. And not to forget Oscar Wilde’s anecdote about how he spent an ‘immensely busy’ morning taking out a comma and then putting it back. Yes – I do enjoy that reference to ‘decomposition’, in relation to Beckett’s corpus. American English in general uses more commas. I didn’t know this was the “New Yorker” one(,) though. Because I summarise texts for a living now, I’ve got into the habit of using such “American” commas a lot more, especially after temporal constructions such as “last year”, “today”, etc. When writing non-work texts, however, I don’t include those, as I don’t consider them native to Hiberno-English and they have a whiff of American finicky-ness. Finicky is a good way to describe some of the New Yorker ones. But it would take more time than I have at hand to delineate which commas could be classified as ‘New Yorker commas’ and which more broadly US or close style. There’s some discussion of the former in the comments at this Language Hat post (also linked in par. 6). I have only lately become acquainted with the New Yorker’s reputation, even though I’ve been reading it sporadically for a decade. My education on this has been through Mary Norris’s Between You and Me, a very entertaining account of her tenure with the magazine, read by the author. I have been listening in audiobook form while driving, and that worked very well until we came to the chapter on commas, from which point the importance of the subtitle Confessions of a Comma Queen became clear. It’s a seemingly interminable chapter, in which I got bogged down when she began to read long sections from Melville by way of example and to get very analytical and tangential in her explanations of why commas might appear in NYer articles and stories where even she did not approve. I decided I might enjoy that chapter more in the print edition, but the subject matter turns out to be broad and humanly fascinating, and now I’m interested in Ross. Thank you — and I also thank the commenters before me for their contributions. Mary Norris is an entertaining guide on such matters, though her taste in matters of grammar and style are rather prescriptive and old-school for me. In this, she is attuned to the New Yorker, which resists modernity. Language Log has tackled its problematic attitude to linguistics many times. We do change our style from time to time. My predecessor […] told me that she used to pester the style editor, Hobie Weekes, who had been at the magazine since 1928, to get rid of the diaeresis. She found it fussy. She said that once, in the elevator, he told her he was on the verge of changing that style and would be sending out a memo soon. And then he died. Ha! Just today I read on Quora Norris’s answer to the question, “What punctuation mistakes did you correct the most in your role at The New Yorker?” in which she listed three different examples of commas that were of the sort she often had to remove. Maybe she is trying to improve her reputation in that department, though she does in another Quora answer state that she likes the serial comma. In Between You and Me she writes at length about three cases in the writing of James Salter where she could not figure out why he used a comma where it did not make sense to her, so after much speculation she wrote and asked him, and he wrote back at length to say how all the cases were intentional. Thank you for the diaresis story! Extreme esprit d’escalier. I thought about extending the excerpt to include that zinger, but felt it was long enough already. Glad it came up in the comments. Giving them time to push their chairs back is such a beautiful explanation!